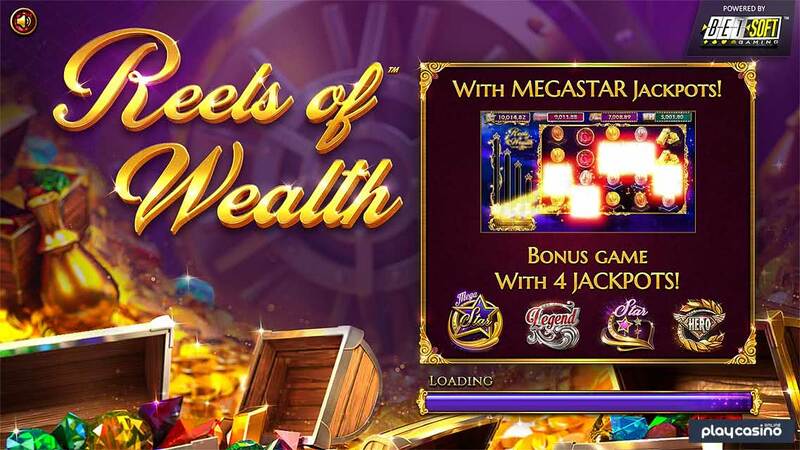 The Reels of Wealth online slot by BetSoft has 10 paylines of action with multiple progressives and a bunch of ways to win with wild multipliers, rolling wins, free spins and the Megastar Feature. The wealth-based theme of BetSoft’s Reels of Wealth video slot is all about putting players in a position to get some big payouts. This is done at the expense of some of the small and medium prizes, which helps to contribute to this title having a high volatility. However, it’s definitely a game with a lot of depth, and though it has progressive jackpots, it doesn’t rest on them in terms of providing players with solid gameplay. 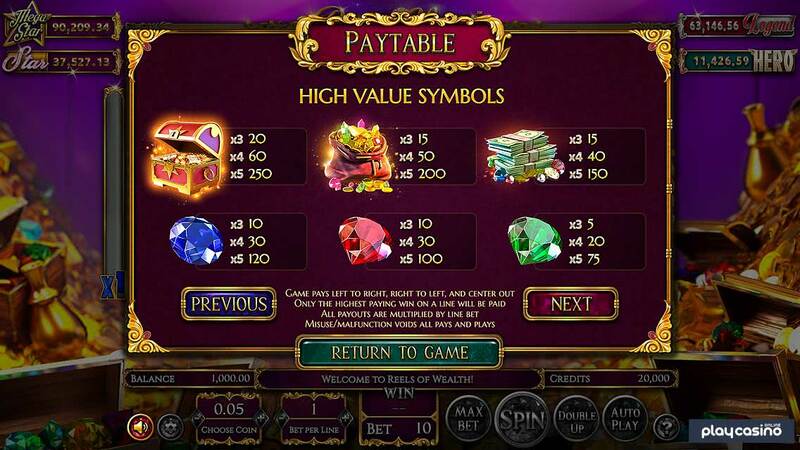 Instead, there are a lot of other ways to win aside from the regular pay table and top jackpots that can give some pretty serious prizes as well, and that helps to give it a more well-rounded feel than some other titles in this sub-genre. The format here is pretty normal with five vertical reels and three horizontal rows. You’ll find that the 10 paylines pay left-to-right and right-to-left, and they can be changed in number. However, doing so drops the RTP percentage, which means you’ll have less of a chance of having a winning session. You obviously don’t want that, so it’s best to keep the number of paylines at 10 and use other controls if you feel like you want to choose a smaller wager. Wager-changing options center around the number of coins you’re betting and how much those coins are worth. The coin values start at $0.01 for a minimum bet size of $0.10 per spin, which is well within reasonable no matter what the size of your bankroll happens to be. Since you can use coins worth up to $1, and since players have the ability to have up to 10 coins wagered on each payline, you’ll be in good shape with a maximum overall wager of $100. No matter what bet size you’re looking for, you’ll find something that comes pretty close with these options. 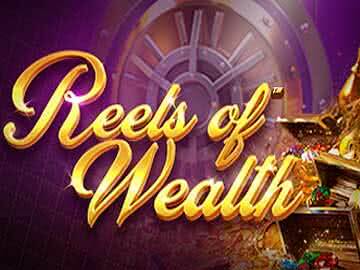 You’ll find yourself rolling in wins with the Reels of Wealth video slot’s Rolling Wins feature. Whenever you get a winning spin, you get a free re-spin immediately after. If that re-spin wins, the process continues until you get a spin with no wins. 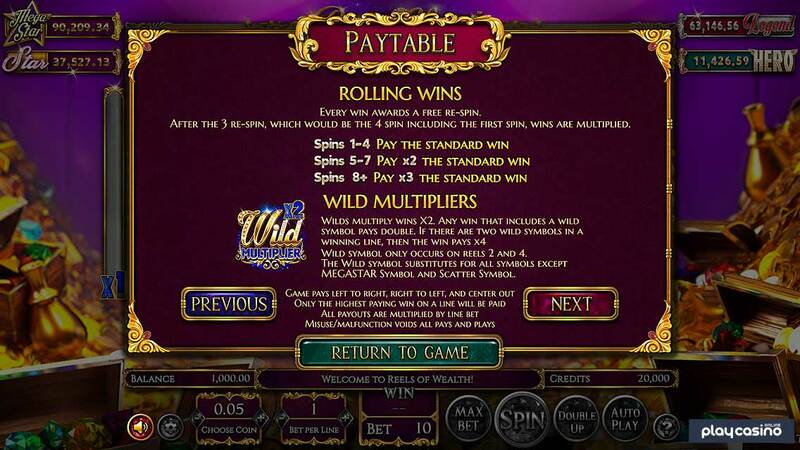 The fifth, sixth and seventh re-spins in a set get a 2x multiplier applied to all non-progressive payouts. On top of that, the eighth and higher re-spins are hit with a 3x mulitplier on the same. This is a fun way that they have added chances for extra wins, and on top of that, with the multipliers incorporated into it, you can turn this into an extremely valuable feature if you go on a string of paying spins. On the second and fourth reels of this game, you will see blue and gold wild multiplier symbols. They have a “2x” attached to them to remind you of their multipliers. Any winning combination that includes one of these is doubled. However, if you earn a winning combo that has both of these wilds in it, then the multipliers stack to multiply your total payout by a factor of four. This is another tremendous opportunity to win some significant pays thanks to big multipliers being available. 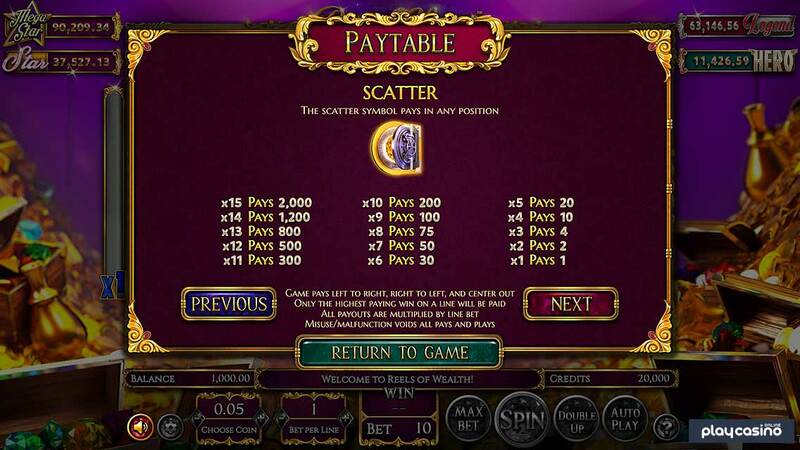 We can’t remember having ever seen a scatter symbol quite like the one that you’ll find in the Reels of Wealth online slot. It’s a symbol of a bank fault opening, and it can appear stacked as well. On top of that, you can get wins for even just one of them landing on the reels. A total of 15 of a kind gets 2,000x, and the prizes drop steadily down to a 1x prize for just one of a kind. Keeping in mind how the re-spin feature works, getting just one scatter gives you a re-spin after paying you back for your initial turn, so it’s like getting that spin for free. 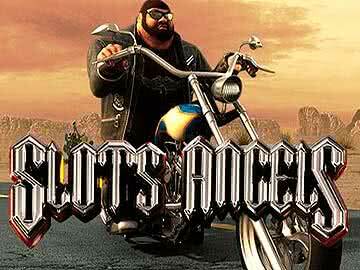 There are four MegaStar progressive jackpots. In order of size from largest to smallest, they are the Megastar, the Legend, the Star and the Hero. 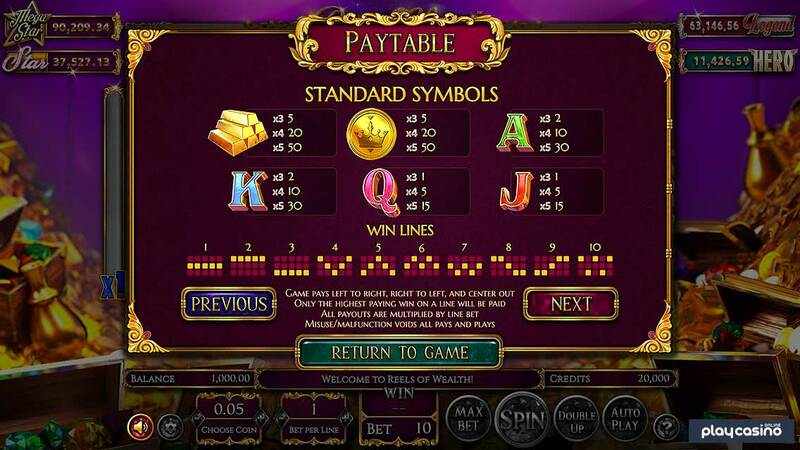 During the MegaStar feature, you’ll get a special symbol set and the chance to win one of these four jackpots through its trail system, which is essentially another way of showing your random chance of winning each of the four. 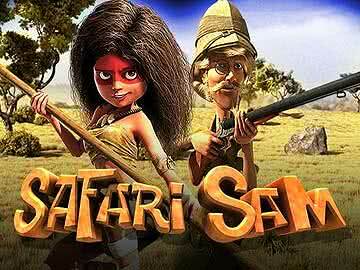 The smallest jackpots are won more often than the largest ones in this slot, which is what you would typically expect. 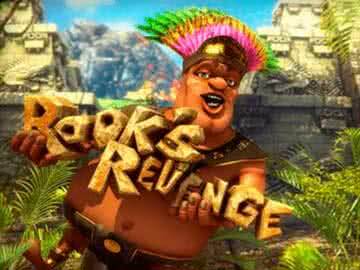 This takes place in the MegaStar Free Spins mode. 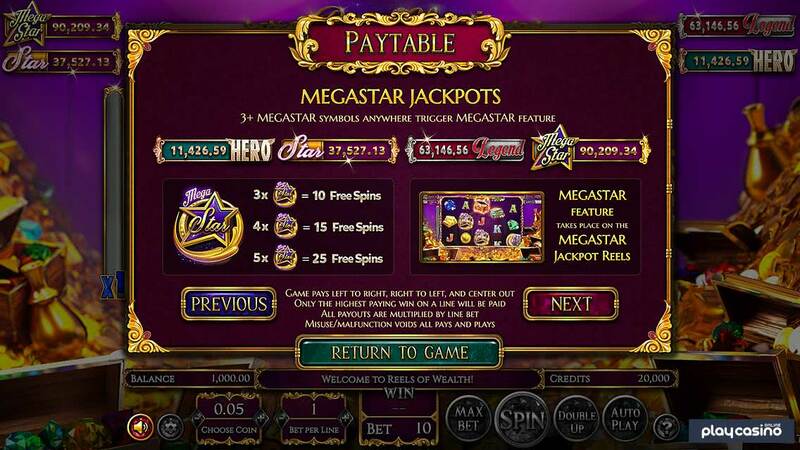 Three, four or five of the MegaStar symbol (as a scattered bonus symbol) will get you 10, 15 or 25 free spins, respectively. It’s a fun way of combining two different key features and giving players lots of ways to get paid all at once. All of the symbols in this game use gorgeous, 3D graphics. It starts with the chest symbol, which will earn you 250x for five of a kind. You can pick up 200x for five of the bag of gems as well, which is another fairly sizable pay. A win of 150x is yours for five of the stack of cash. The blue, red and green gems also pay out 120x, 100x and 75x for five of a kind for each. The bottom end of the pay table is pretty straightforward, and it happens across three tiers. First is the 50x tier, and five of the gold bar stack or golden coin will trigger this prize. You can earn 30x for five of the green A or blue K, and five of the pink Q or red J symbols will get you 15x as well. These wins are pretty balanced considering you’re only spending 10 coins per turn to get them. This game is completely jam-packed with different ways to win some pretty sizable prizes. The progressive jackpots can run up to some pretty significant levels. 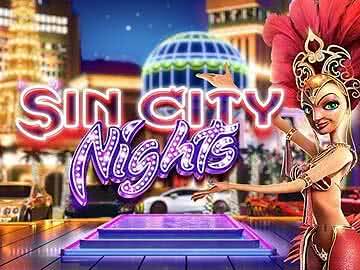 The low minimum bet size makes this slot accessible to virtually all players. The high volatility isn’t something that all players will enjoy. The top payouts on the regular pay table are somewhat on the small side. 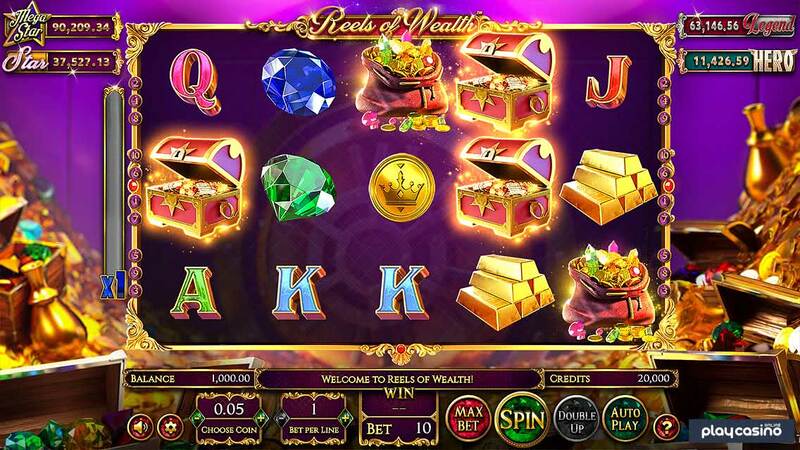 With the Reels of Wealth online slot by BetSoft, you’re getting an interesting mix of progressive slot with a game that genuinely looks good with 3D graphics and an entertaining spin on a somewhat common theme. The re-spin feature and opportunities for free spins are pretty nice, but the scatter really kicks this game to a whole new level since it combines really well with the re-spin feature as well. The main thing that you need to understand about this game is that it’s geared towards a somewhat niche audience. It’s an excellent part of their overall portfolio, but it’s not the type of game that will appeal to all players. If you don’t like a lot of volatility or big swings, then they have plenty of other titles that you will definitely fall in love with, but this one will most likely not be it.